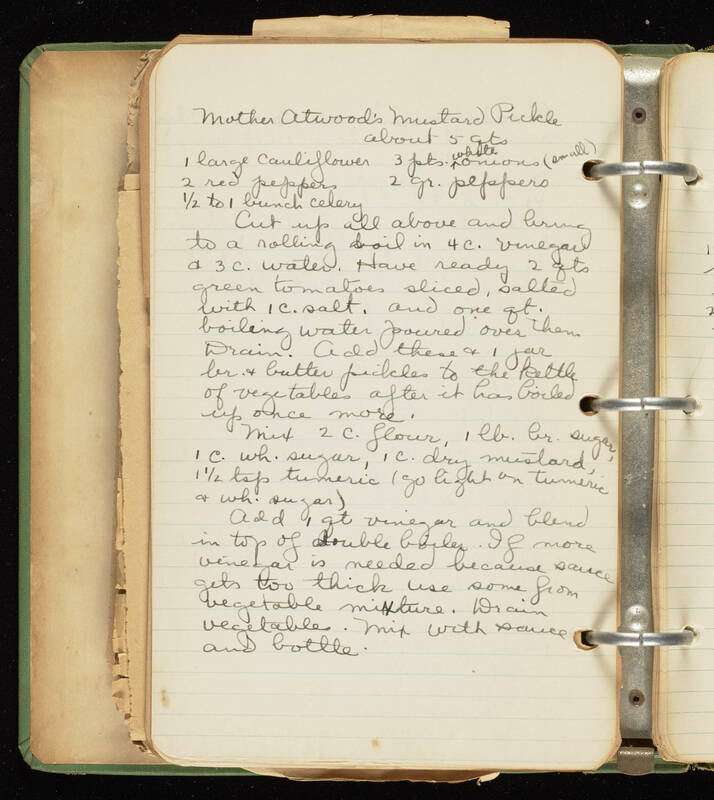 Mother Atwood's Mustard Pickle about 5 qts 1 large cauliflower 3 pts white onions (small) 2 red peppers 2 gr. peppers 1/2 to 1 bunch celery. Cut up all above and bring to a rolling boil in 4 c. vinegar & 3 c. water. Have ready 2 qts green tomatoes sliced, salted with 1 c. salt. and one qt. boiling water poured over them Drain. Add these & 1jar br. & butter pickles to the kettle of vegetables after it has boiled up once more. Mix 2 c. flour, 1 lb. br. sugar, 1 c. wh. sugar, 1 c. dry mustard, 1 1/2 tsp tumeric (go light on tumeric & wh. sugar) Add 1 qt vinegar and blend in top of double boiler. If more vinegar is needed because sauce gets too thick use some from vegetable mixture. Drain vegetable. Mix with sauce and bottle.